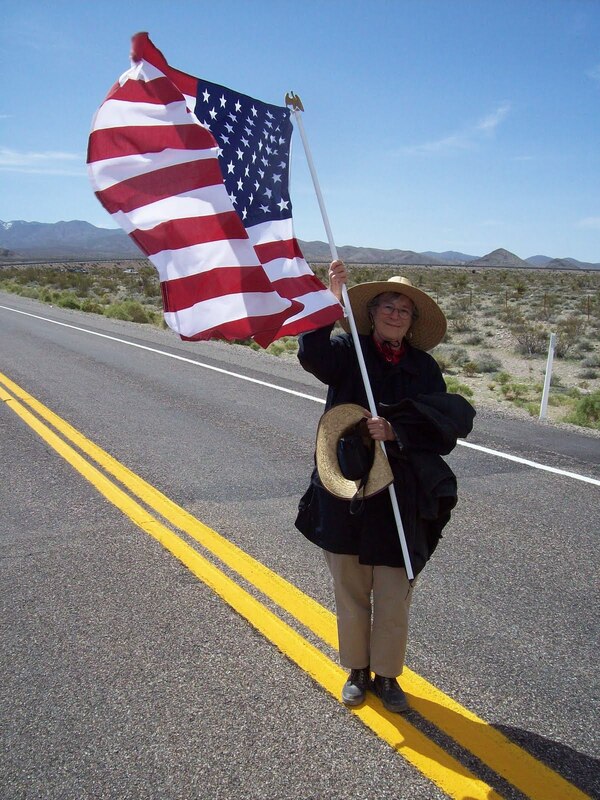 The Shoshone walk/run is a cultural event that takes place around the Nevada National Security Site , which use to be named the Nevada Test Site and also where the Nellis Air Force Base sits as well, but the land it sits on is the land of the Western Shoshone Nation. The Main purpose of the walk/run is to plant willows with our thoughts and prayers that goes in the hole thats made by the people with a pinch of tobacco offering, willows are spread out 3 or 4 miles apart while thats being done runners and walkers get spread out 2 miles apart and start of their walking or running after that 2 miles thats been covered then the supports with vehicles pick them up and go meet up with the people who are doing their prayer with the willow. 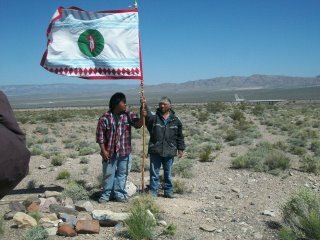 Before we all start off the walk/run we get together and set up camp at Warm Springs, NV which is north of Tonopah NV. When we gather as people we make prayer ties which is tobacco in little squares of red cloth with little string for the main staff pole that we carry across the land while we do our walk and run. We also use sagebrush that goes with each runner and walker, the reason why use sagebrush is to keep our strength up when were feeling weak or feeling hot its something thats used for medicine. As for the camp set up every morning before the sun comes up theres a sunrise ceremony that takes place, in the middle of the ceremony one person covers about 2 or 3 miles with the staff pole after that he or she comes back and we all eat breakfast, when everyone is done eating we start to tear down camp which is the teepee, kitchen tent, and whatever else like tents, bags, chairs, tables, bins with food supplies, and anything else that needs to be put away. After all that has been done we circle up and get information from the main person who leads the walk/run which we’ll talk about how the day is going to be or how the day will turn out then we start dropping of the walkers and runners (Depends on how many walkers and runners there will be) and do the same thing till we get to the Nevada National Security Site. There will be more information for the Western Shoshone Walk/Run in this group such as the actually event that will take place I hope you can join us when that time comes. One more thing not just Shoshones can be there, EVERYONE can participate in the running and walking lets put our thoughts and prayers together as people. Kindly pass along to your friends and neighbors. Thank you! 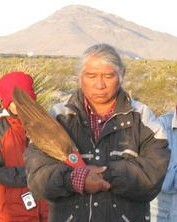 Western Shoshone Nation at Mercury, Nevada. 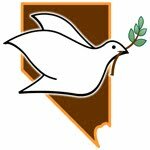 What: A new sign for Mercury, Nevada, and civil resistance to the illegal occupation of the Western Shoshone Homeland and nuclear weapons. 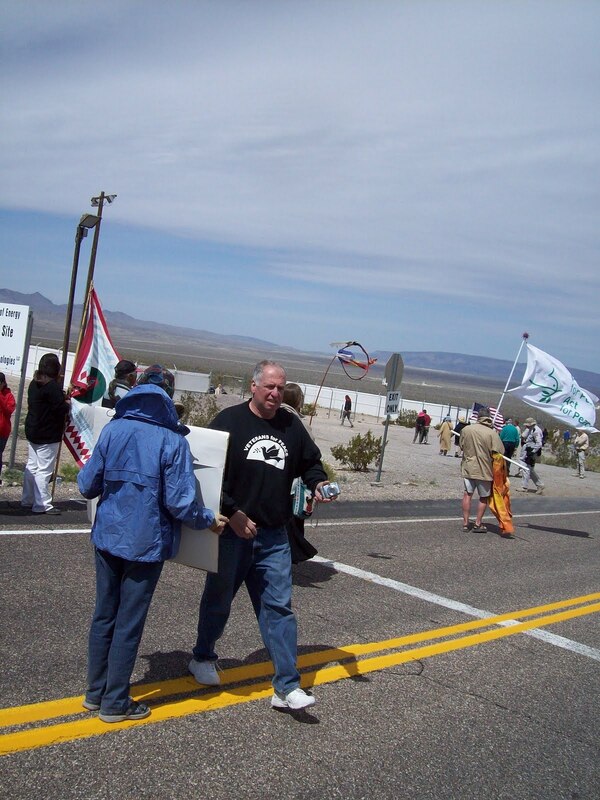 Who: Members of Veterans For Peace, the Western Shoshone,Nevada Desert Experience, Code Pink, and concerned citizens who support justice for the Western Shoshone and nuclear abolition. Why: How is the war economy working for you, Las Vegas and how will you like the nuclear waste that the US government will once again try to shove down your throats at Yucca Mountain? 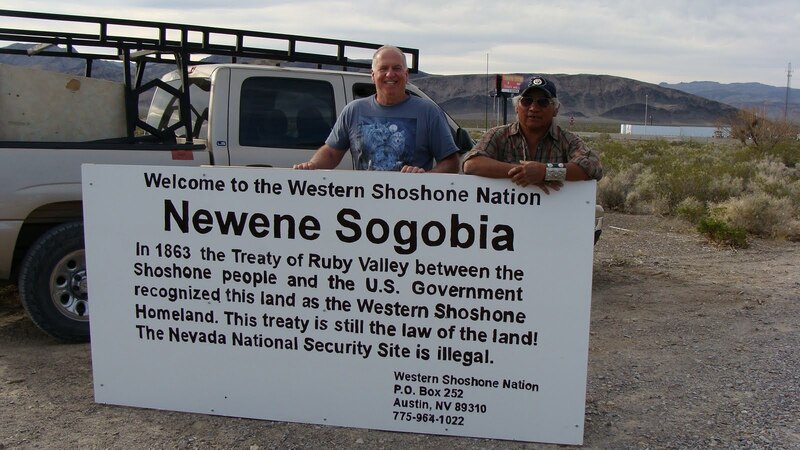 The illegal occupation of the Western Shoshone Homeland has brought nothing but misery, disease, hatred and distrust to the world with the development of nuclear weapons. It is time to wake up. Time is running out. Let us hope we can learn from Japan. Restoration of the Western Shoshone Homeland will beginning the process of restorative healing which is so deeply needed. John Amidon (center) and Johnnie Bobb (right) in attached picture. In 1948, Western Shoshone lands were seized to create the Nevada Test Site, forcing over 100 families to abandon seasonal or permanent family camps. 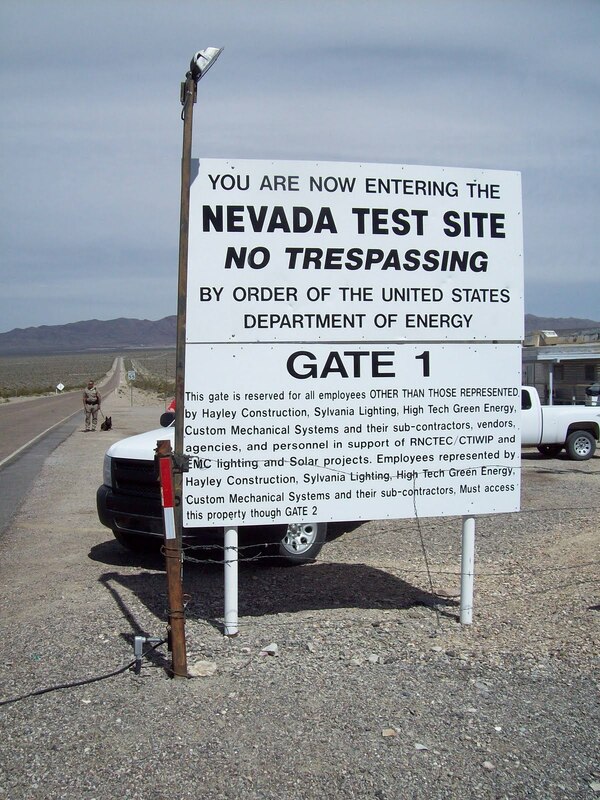 Many burial and cultural sites exist within the Test Site and are inaccessible to the people. No compensation was ever offered. 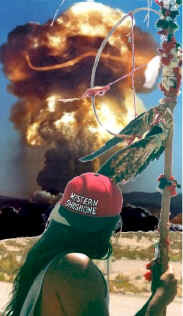 The Western Shoshone are the most bombed nation on Earth, with over 1,000 nuclear bombs detonated on their lands by the U.S. and Great Britain. 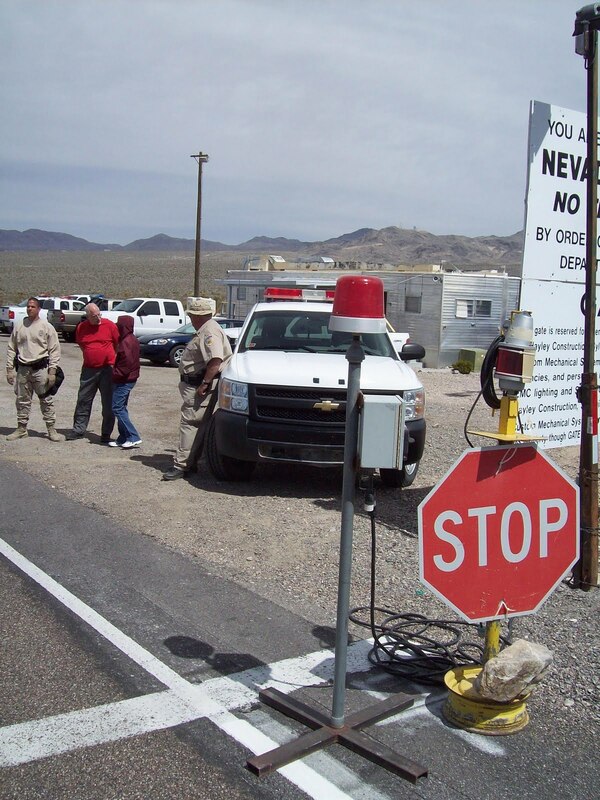 In 1987, the Western Shoshone National Council exercised their sovereignty and challenged U.S. jurisdiction by issuing WSNC Land Use Permits to participants of anti-nuclear gatherings at the Nevada Test Site. Since that time, hundreds of simple trespass actions onto the Test Site have not been prosecuted, because the government wants to keep the issue of the Ruby Valley Treaty out of the courts. On February 14th, 2002, Energy Secretary Abraham recommended Yucca Mt. as the site for storage of all US irradiated reactor fuel and other high-level radioactive waste. If passed, the federal government would ‘ withdraw’ (steal) another 260 square miles of Newe Sogobia. The DOE hopes to complete their license application by the end of 2008. The WSNC is completely opposed to the Yucca Mountain project, and has passed a resolution making all of New Sogobia a Nuclear-Free Zone. Litigation continues. WSNC member Johnnie Bobb, a spiritual leader from the Yomba Shoshone Reservation, has led the annual spring Newene Sogobi Mava’a Mia: Western Shoshone Walk On the Sacred Land since 2000. 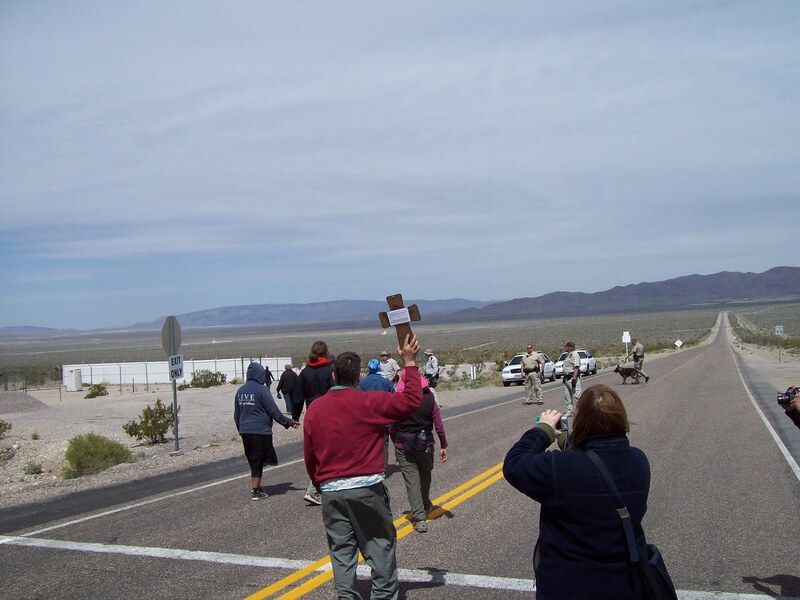 Walkers and runners alternately encircle the western and eastern boundaries of the Test Site the first two years, ending at the NTS gates or Yucca Mountain. They conduct prayer ceremonies and vigils, visit communities, and bless waters, hot springs, all living beings and the land along the way. People in civilian clothes across the line are from the Department of Energy. 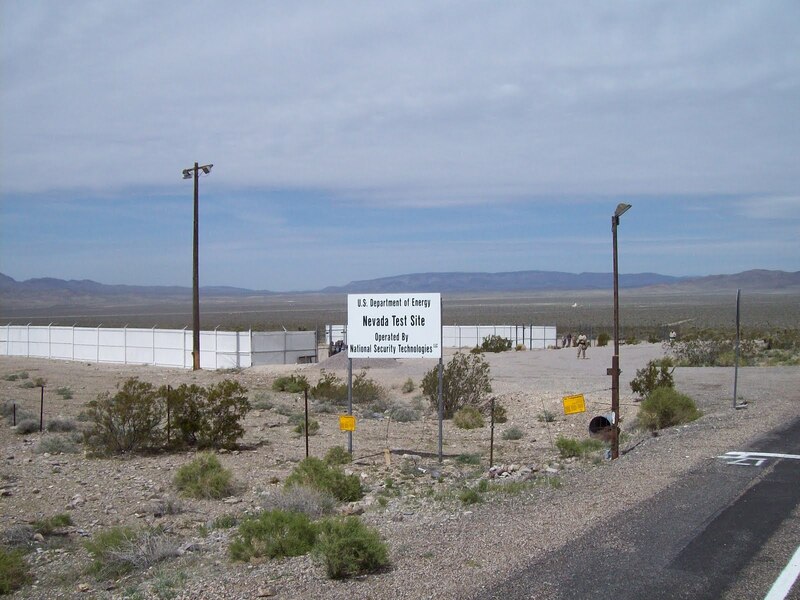 Nine men and twelve women crossed the line at the enttrance of the Nevada Test Site, and were immediately directed to a detention “facility” near the entrance. 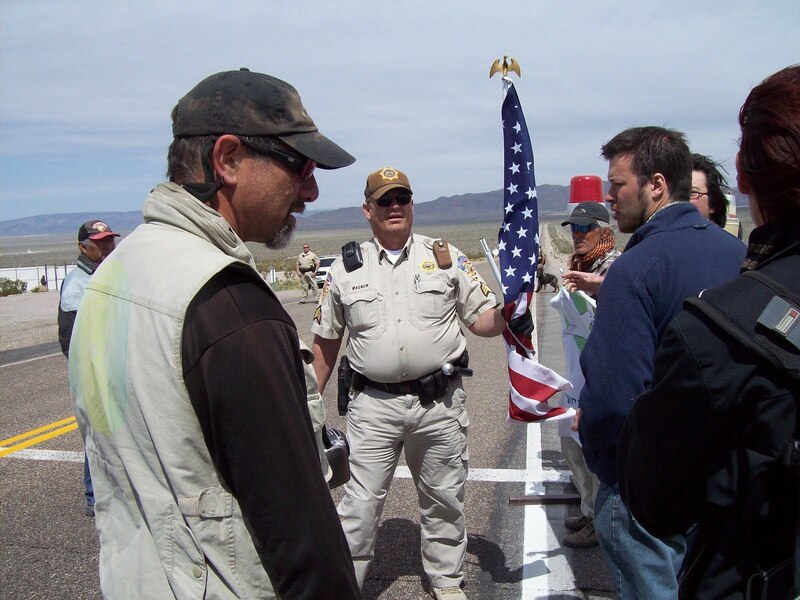 Banners were confiscated, except the US flag, which was rejected since the other banners were withheld. 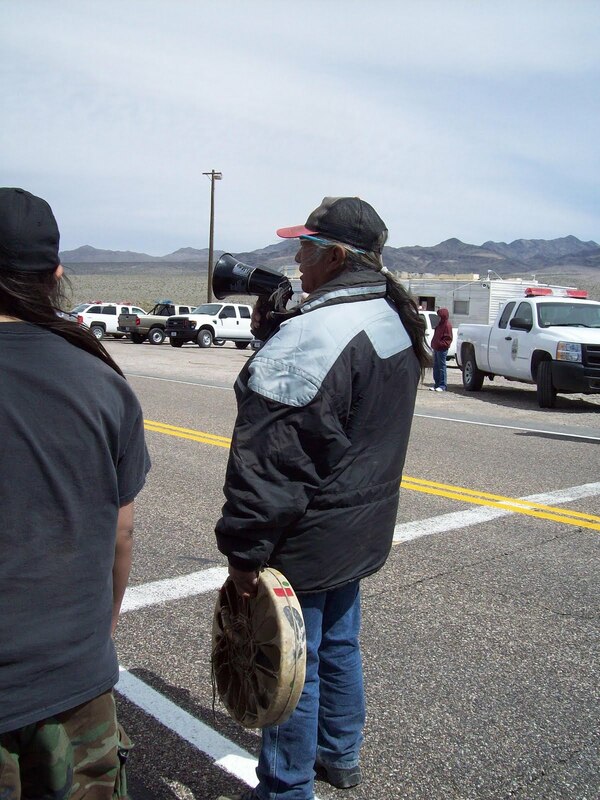 Johnnie Bobb spoke to the policemen and the civilians representing the Department of Energy at the entrance about the not-honouring of the treaty according to which the test site is Western Shoshone Land. Making it a nuclear test site is genocide of his people extended, he said. We will have full coverage and pictures of walk and vigils shortly.